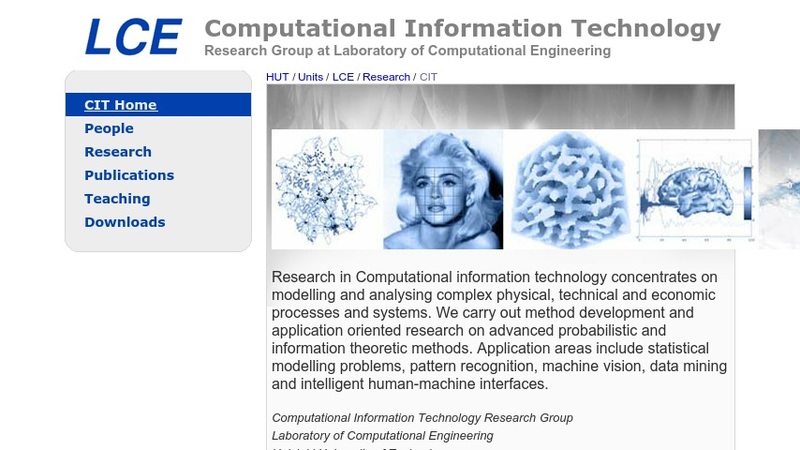 Computational Information Technology is a research group of the Laboratory of Computational Engineering at the Helsinki University of Technology in Finland. This section of the website introduces visitors to the group's work on modelling and analyzing complex physical, technical and economic processes and systems. Researchers "carry out method development and application oriented research on advanced probabilistic and information theoretic methods." Some applications include statistical modelling of financial markets, pattern recognition in neural networks, machine vision for microscope image processing, data mining, and intelligent human-machine interfaces. The Research Projects section describes the group's work in these areas and highlights the mathematical and statistical methods used, such as Bayesian methods, vision geometry, Turing's reaction-diffusion systems, and time-frequency analysis. Each research area has its own website, where the overall project and theoretical framework is described along with images and diagrams. Publications, such as theses and journal articles are listed and some conference proceedings and articles are available to download.